Instantly search yourself, a friend or even a relative. Stay up to date on the traffic ticket history of anyone in the U.S.—search public court records for a low fee. Unlimited searches for 30 days. 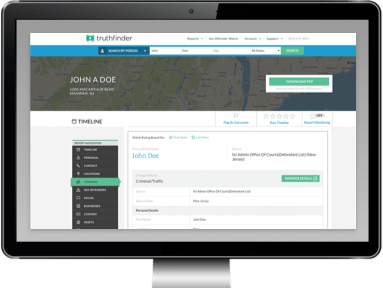 Disclaimer: TruthFinder cannot be used for employment or tenant screening. TruthFinder is not a consumer reporting agency as defined by the Fair Credit Report Act. If you lost your MA civil citation, you can contact the appropriate traffic court OR the Massachusetts Registry of Motor Vehicles (RMV). If you lost your MA criminal citation, you'll need to get in touch with the appropriate MA district court. It's important to obtain your lost ticket information promptly. Be sure to respond to your criminal traffic violation within 4 days, to avoid a bench warrant for your arrest. NOTE: If you're looking for a lost parking ticket, you'll need to contact the parking clerk in the city where you received it. If you received a civil citation, both the Registry of Motor Vehicles (RMV) and the presiding traffic court can help you with your traffic ticket search. The MA RMV accepts online payments for civil citations; however, you must have your citation number to use the online payment system. Because you've lost your traffic ticket, you probably don't have your citation number—therefore, finding lost traffic ticket information online might not be an option for you. However, because the MA RMV also accepts civil violation payments by phone and in person, it's likely a representative can help you find your traffic ticket information. Simply contact the RMV and ask about retrieving this information. NOTE: If you would rather visit your nearest MA RMV location in person, consider calling first to make sure the office can provide the information. You can also gather information about your lost civil citation from the presiding traffic court. The “presiding traffic court" is the court that handles citations in the area where you received the traffic ticket. Generally, these are district courts. For contact information, refer to the state's courthouse locator and choose the local courthouse is the appropriate area. You MUST contact the appropriate traffic court if you received a criminal traffic citation. Note that the court MUST receive a response to your criminal citation within 4 days of receiving the ticket. Because you've lost your ticket, it's crucial you contact the court as soon as possible to avoid additional—often more severe—penalties. Whether your violation requires a court appearance. Your ticket should be marked “Criminal Application" if you must appear in court, but because you've lost your traffic ticket, you might not remember if it's a civil or criminal citation. Exact traffic ticket information, including your citation number. You definitely need your citation number if you're eligible to pay your fine online. The deadline by which you must pay or otherwise respond to your ticket. Your exact traffic ticket fine, as well as any court costs and other surcharges. Your eligible payment options and methods. These could vary depending on your violation and court policies. You can plead “guilty" to your traffic ticket and pay your fine outright, or you can plead “not guilty" and schedule a hearing to challenge your citation in court. Refer to our Pay Traffic Ticket and Fight Traffic Ticket sections for details about each process, including response deadlines and court appearances based on your violation. Looking for Lost Traffic Ticket in another state?